This is the second part of a two-part series on Barsony ceramics. The first part focused on lamps, their values and sourcing. This second part will look at Barsony ceramics other than black lamps and correct identification. First lets look at identification. Number one, not all Barsony products are marked. It is not known why this, nor which products may be unmarked, it may simply be that the mark was lost during firing on a variety of items. 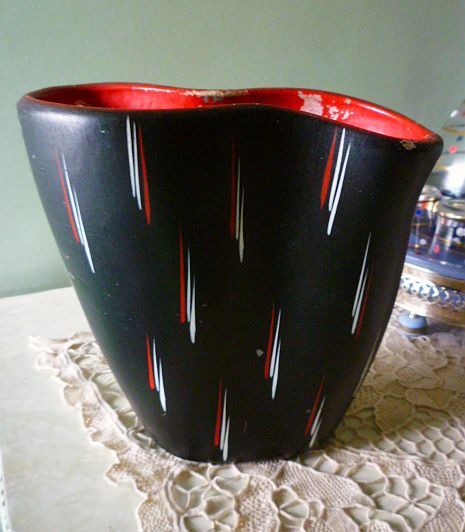 This vase of mine, for example, has no marks at all, but I believe it is a Barsony, due to the style of the painting and the weight, finish and feel. The weight and feel can only be learned by handling the real thing, the finish is the typical satin black common to all black Barsony products. 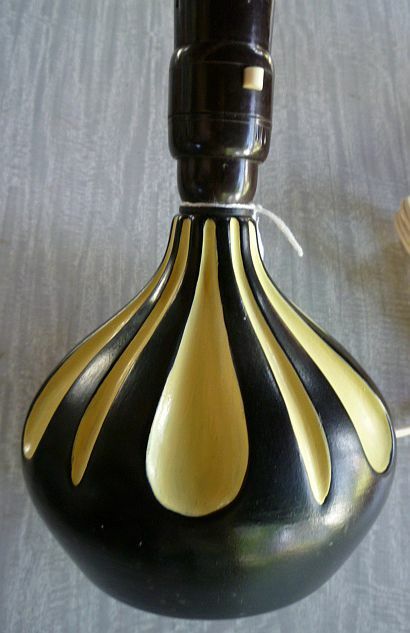 If you refer back to part one, you'll notice the hand-painted stripes on this vase are very similar to many of the Barsony lamps. Most, if not all, Barsony products would have been issued with a sticker, as shown above. 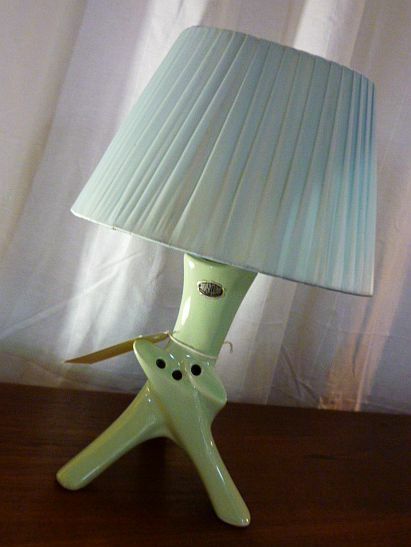 The blue sticker, together with the mark 'Barsony' underneath, dates this lamp to the late 50s-late 60s period. From the late 60s to the 70s, a red and gold sticker was used and the word 'Barsony' was no longer seen. Only items made from the late 50s until the late-60s were marked 'Barsony' and some were marked 'George Barsony Ceramics'. The other mark you see here, 'FL-41', is an example of the standard Barsony marking system. All products were coded according to a letter and number system. FL for floor lamp, L for lamp, HL for head lamp, V for vase, etc, followed by a number. These are usually separated by a dash or a slash, but not always. ...as shown on this little lamp. This little beauty is another of mine, I have yet to find the perfect plastic ribbon shade for it. This Barsony figurine is from the earlier period, and you can see where the sticker was. It sold on ebay last week for $378. An unusual marking, but there's no doubt as to the maker. There's again no doubt about this lamps authenticity because of the sticker, but the backstamp, below, also fails to conform to the well-known standard. Here are a few more examples of the Barsony backstamp or mark. 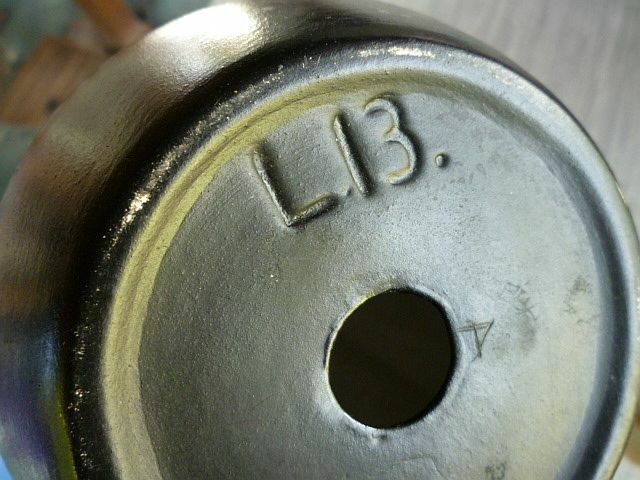 There has been some discussion and confusion here and there in relation to the Barsony backstamp, because the Sydney pottery Kalmar also had similar backstamps. Point being, sometimes it won't just be the backstamp you'll need to look at but a variety of factors including the style, look, feel and finish. Now for a few examples which are NOT Barsony. Some Barsony lamps were mounted on wooden bases such as this. In such cases, a backstamp will be present but not visible without taking the lamp apart. This is not a Barsony btw! Aside from the obvious handpainting and colouration, things to look for when trying to identify Barsony products include soft features, especially of breasts, noses, but just the shape in general. Lips were almost always painted red, and sometimes fingernails were too. Look at the example above, you can see that it is far too angular to be a Barsony. 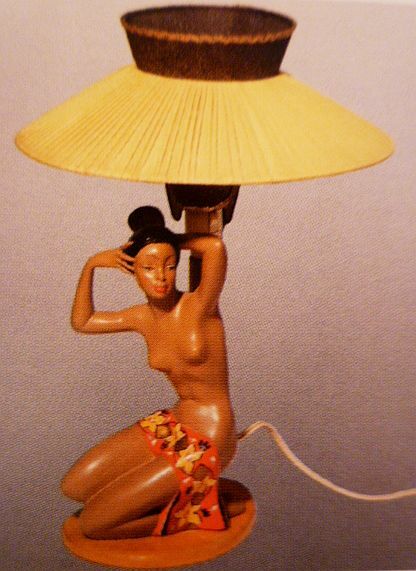 The above figurine is by Sydney pottery Arta, and dates to the late 50s, as does the lamp below. 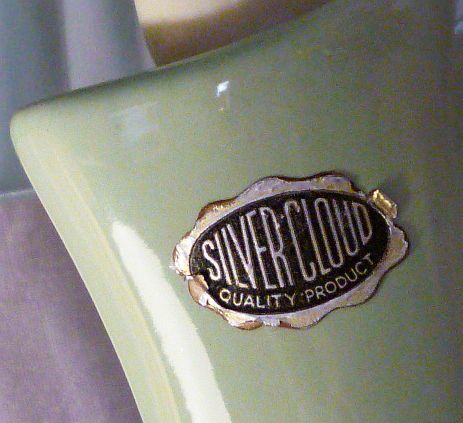 Barsony Ceramics also produced works under the names Silver Cloud and Venice. These are far less well known and collected, although may command very high prices too. Below, a few examples. Unfortunately I have only these few examples to show at this stage. Lastly here's a link to a 3 minute segment of the Australian t.v. show Collectors. Presenter Claudia Chan Shaw largely repeats the information I've given here, but shows an enormous collection which is just breathtaking! Some wonderful examples. Love the tips - I pick up things in stores all the time to see the stamps, marks, or lack thereof and so many times have not one clue what should be there! Another great post! I never pay much attention to labels and the like and buy what I love and most of those beauties would be snapped up if I ever encountered any. great tips,ooooh I want all those lamps..so beautiful. These post are so interesting and very useful. Thank you so much! The lady bust with the red top and lips that you say "is far too angular to be Barsony" is by Moss Ceramics of Sydney. I have two marked ones that are two different lamp bases. Like Barsony they made the most out of a good design. I'm a 44 year old vintage seller and collector who loves all eras from the 20s to the 70s. 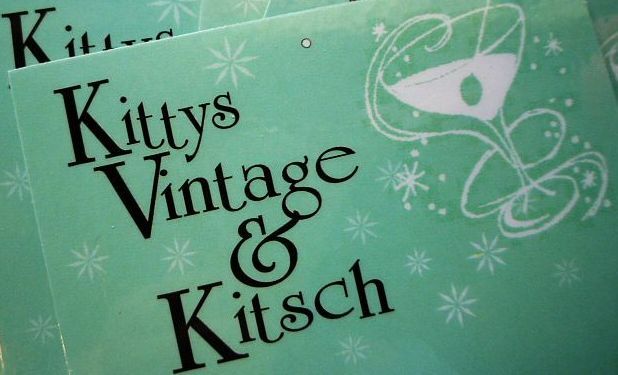 Shabby, retro, antique, rustic, dresses, handbags, vanity & anything outrageous...I DO IT ALL!!! EBAY How-To....Win Things AND Spend Sensibly! You Want This. You Just Don't Know it Yet.